From becoming England's youngest legspinner to a forgotten man, Mason Crane has, by his own admission, endured a rollercoaster start to his professional career. But, after two back fractures and a nine-month stretch out of the game, he is more than ready to resume with Hampshire, a little older but by no means old, and full of hope for the future. "I just want to get on the field. I've had enough now, I just want to get back out there." It's nine months since Mason Crane last played professional cricket. 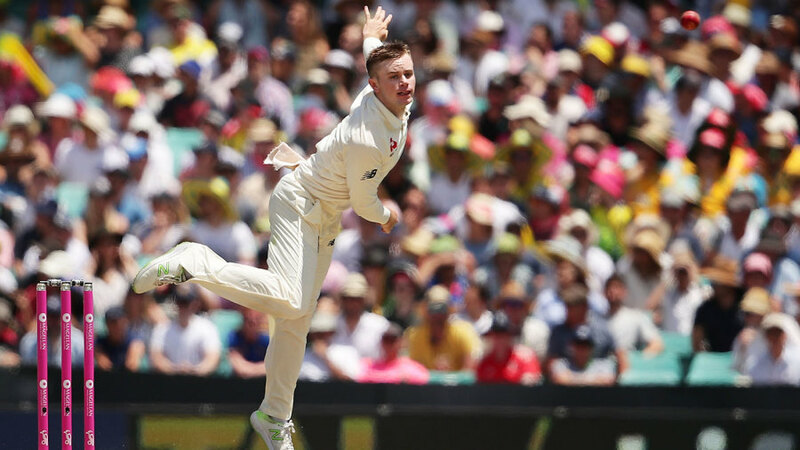 He started 2018 with a Test debut at Sydney, where he became England's youngest-ever legspinner, but ended it as a forgotten man, on the slow road to recovery after a pair of back fractures. "I've had the definition of an up-and-down time of it," he reflects on a sunny spring afternoon at the Ageas Bowl. "If you go back 18 months, I've been on an Ashes tour, and ended up in New Zealand where [the injury] happened. "It was difficult to come to terms with it at the start. It took a lot of getting used to - not playing cricket, not being able to do pretty much anything. "But I've come through the other side now. It's been a lot of days in the gym, a lot of slow progress, but I'm feeling really strong now, really good about it. So hopefully, come the first time I'm out in the middle, I can perform." "Personally, I don't think I should have been there"
The story of Crane's Ashes debut, when he was thrust onto the biggest stage as a 20-year-old, is well-known, and his figures - 1 for 193 in 48 overs - barely told half the story. But it was the weeks that followed which summed up a difficult year. After a long, gruelling tour of Australia, it would surely have made sense for Crane to be given some time at home to rest and recover. But England had other ideas. Instead, Crane was sent to the West Indies with the Lions. He started to lose form, and captain Keaton Jennings trusted him less and less. As Jomel Warrican and Jack Leach thrived on turning wickets, Crane took one wicket across 27 overs, and was dropped for the third and final unofficial Test of the series. "Personally, I don't think I should have been there," he says. "It's one of those things. I can see why I was sent there, but hopefully people can see why I was against going." By the time he landed in New Zealand ahead of the Test series, Crane was in no place to play international cricket. Injury soon followed, and after an initial recovery, a recurrence during the county season ruled him out for six months. "The way it's gone, after the injury, I feel like a better player now. Hopefully in a couple of years, I can look back and be almost grateful that I've had this experience, and now I feel like if I can combat that, I can combat pretty much anything." Crane does not expect to play in Hampshire's first two Championship games - "as a legspinner in England with Liam Dawson in the squad you have to be realistic" - but this summer's schedule is perhaps the most conducive to spinners since the turn of the century. Crane was the leading wicket-taker for Hampshire as they charged to the Royal London Cup last year, and after that tournament's early finish, he will have a run of four-day games at the height of summer before the start of the Vitality Blast. "This schedule is better," he says. "It helps us. It gives us a slightly different role: in April or September, if you do play you're normally trying to hold an end. As a legspinner, you're not really expressing what you can do." "Hopefully, this gives me an opportunity. We've got a couple of outground games this year too - hopefully it'll spin and I'll get to play. I also have to realise that I'm 22 years old, that I've got time on my side. I feel like I'm improving all the time, and hopefully I'm able to force my way into the team no matter what time of year it is." Indeed, it is easy to forget how young Crane still is, since he talks with a maturity that is not found in every young cricketer. After a whirlwind start to his career, time away from the game seems to have helped him. "I've blinked and this is my fifth season here - it's crazy really. I think this injury really has given me a different perspective on it, and how much I just really enjoy playing as much as anything else. "As much as I want to do well, play for England, win a Championship, win a T20 competition, I'm just happy to be out there. At the start of this season especially, I'm happy to be here, happy to be fit, and hopefully I can be on the field to contribute to some Hampshire wins. "I don't see why we can't do well in all three formats - it's an exciting team, we've got a new coach who has taken us in a really good direction so far. I'm really excited for us, and hopefully we can add some silverware." It is a theme that Crane keeps coming back to: hope. After so long out injured, there is a tantalising uncertainty about what the future holds, containing within it that sense of mystery on which legspinners thrive. But for now, the day that has been nine months in the offing is in touching distance. For Hampshire, for England, and for the man himself, the idea of Mason Crane at the top of his mark again is a compelling prospect. "It's been tough to get here," Crane concludes, "but I'm really looking forward to getting started."